How do you combine literature, science, and food? 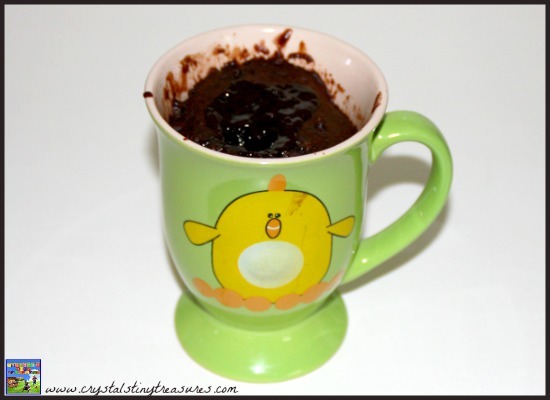 By baking a chocolate lava cake in a mug! Inspired by Harry and the Hot Lava book by Chris Robertson, we wanted a special treat while Phil has the week off. We haven’t had a cake in a while, so this was perfect. It also avoids the food allergies in our home, bonus! 1) Mix all of the lava cake ingredients together in a bowl. 2) Put the lava ingredients in a mug and microwave until the chocolate chips are just melted. Be careful not to burn them. Stir together. 3) Spoon half of the cake ingredients into a mug. 4) Make a well in the centre of the cake mixture and spoon the lava into it. 5) Add the rest of your cake mixture to the mug. 6) Put your mug into the microwave for 60-90 seconds until the top of the cake is firm. 7) Enjoy! 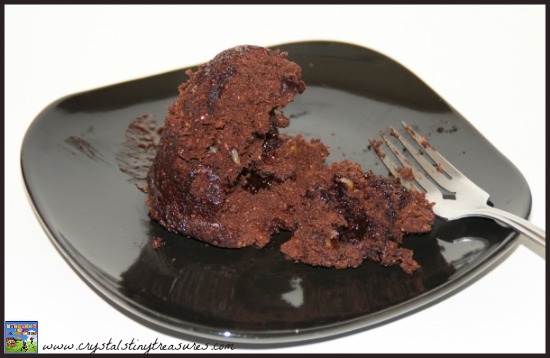 You can eat your chocolate lava cake right from the mug, or you can turn it out onto a plate. 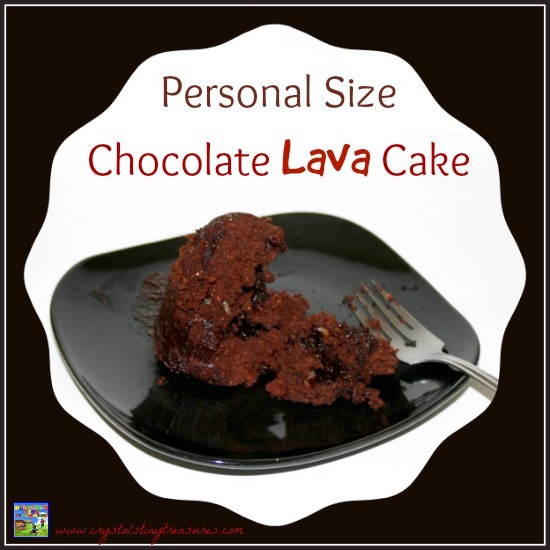 The lava should oozy and delicious when you cut into the cake. In the one above some of the lava actually erupted through the top of the cake while it was baking. That’s the thing about volcanoes; they can be unpredictable! My family really enjoyed this cake, and by using almond milk, non-dairy chocolate, and no eggs, this recipe is allergy friendly for us! If you can’t use almond milk I’m sure rice or soy milk would also work, though we haven’t yet tried it this way. The second time we made this, we used orange flavoured chocolate chips and that was even more delicious! If you’d like to see more delicious kid-friendly recipes, click over to our pages on healthy snacks or tempting desserts. Or if you’d like to see more books that have inspired us to be creative, check out our books and book activities page. We also made a baking soda and vinegar volcano science experiment. 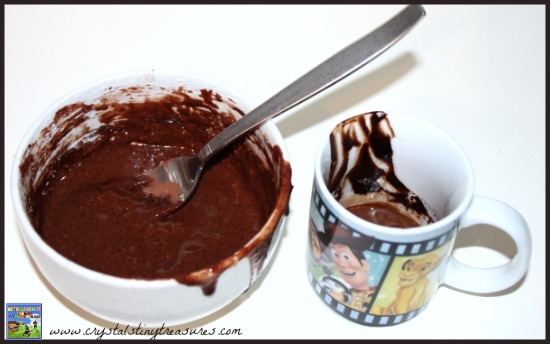 Have you ever made a cake in a mug? How did it turn out? We’ve had fun with this one, I think we’ll be making more in the future! This could be trouble at night with my sweet tooth!! Thank you for linking up to the Bloggers Brags Pinterest Party. I have pinned your post to the Bloggers Brags Pinterest board. This is the perfect size for a sweet tooth, and maybe even a little to share…well, maybe not! That sounds fantastic! Mug cakes are so fun and this recipes looks so tasty. Thank you for linking at the In and Out of the Kitchen Link Party. Hope to see you again next week. This looks wonderful! Thanks for linking up with “Try a New Recipe Tuesday.” I hope you will be able to join us again this week. Thank you 🙂 I hope we’ll see each other again soon.